Today it was starting to feel a little more like fall here in Durham. Since returning home safely after my trip across the country with my sisters last week (see my Instagram page for a recap! ), I’ve been all out of sorts in terms of time zones, days of the week, and seasons. CA was springlike- cool, sunny and breezy; Utah was HOT but really not humid at all, Colorado had snow blanketing its mountain summits, and Kansas was, well… a lot of corn. And we tried to forget the rest. Except when I got us lost in Ferguson, MO after being distracted from my role as navigator. That wasn’t a very happy moment. Even after one week of being gone, I’ve noticed that college students have started trickling back to campus, lined paper has started appearing in the “dollar deal” bin near the checkout line at Target, and commercials have started targeting teens with the latest fall trends. 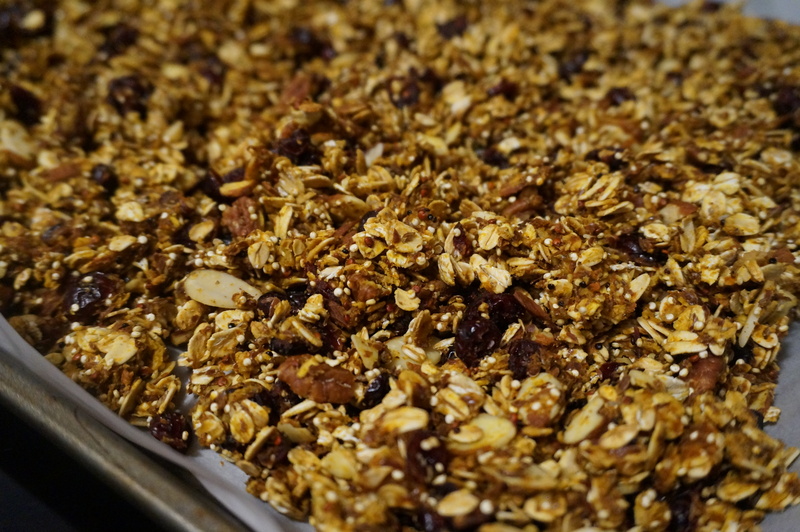 In honor of that back-to-school feel, I decided to recreate an old fall favorite: spiced granola. Adapted from Skinnytaste, I’ve made this a few times using different swaps based on what I had in the house. In the past I’ve used kamut to supplement the oats, but this time I used the quinoa the original recipe calls for. I also swapped in molasses (since I have a TON leftover from my Brown Butter Ginger Molasses Cookies) and almonds in place of pepitas. I love this recipe because it hardly uses any oil at all (only 2 tsp for a double batch), yet the granola still forms nice little clusters. It irks me when I see recipes that call for over a half cup of oil… you really don’t need it! I doubled the recipe since I always end up giving some away- it makes a perfect gift! Enjoy with sliced apples, pears, or peaches, over yogurt or with some nice cold milk. Happy (almost) fall! Fall is almost here! 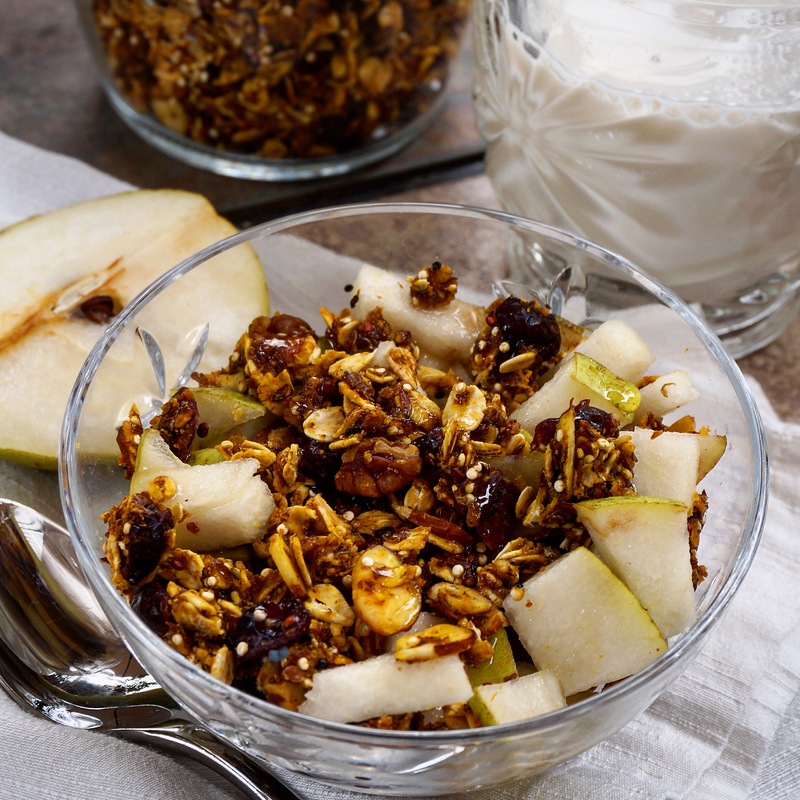 To get you back in that pumpkin-spice state of mind, try this easy granola recipe that’s great with yogurt and fruit! Feel free to stick with the recipe here or experiment based on your own tastes and ingredients you already have. Rinse quinoa and pat dry. Spread quinoa and oats evenly on a large cookie sheet lined with parchment paper. Toast for 10 minutes, stirring halfway through. Remove from oven and reduce heat to 300 deg. 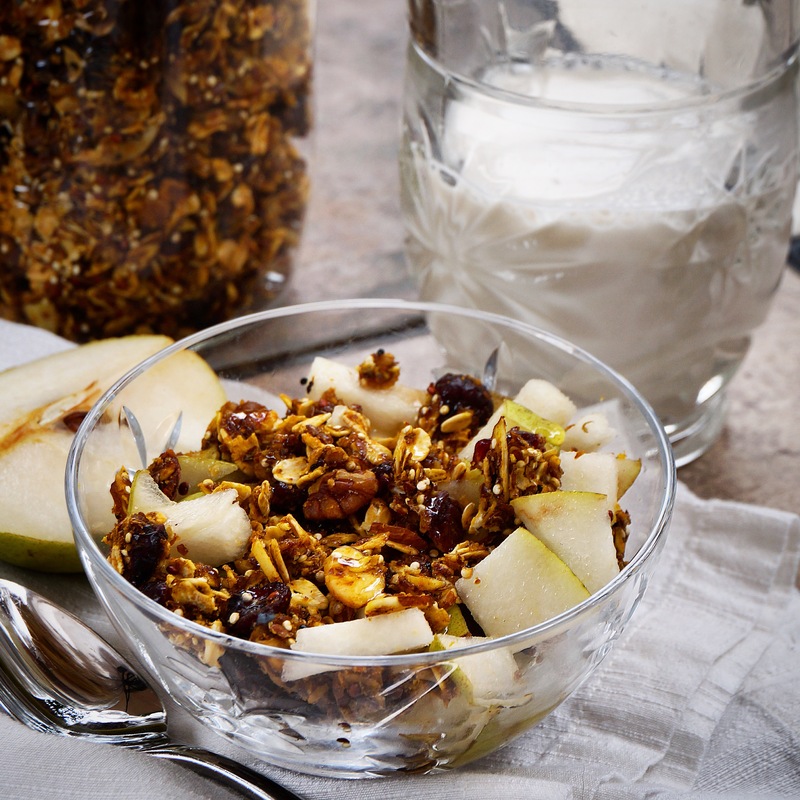 Combine dried fruit, nuts, and flax with the oats and quinoa. In a separate bowl, whisk together pumpkin, oil, molasses, honey, vanilla, spices, salt, and pepper. Pour over dry ingredients and stir until coated. Spread mixture evenly on the same lined baking sheet, and return to oven for 20 minutes. Stir and return to oven for 5 additional minutes or until golden brown. Allow to cool, resisting the urge to stir too vigorously (this allows nice clusters to form!). Store in sealed containers for up to 2 weeks.